The Mythos STS SuperTower speaker delivers impressive, high-end home theater sound. 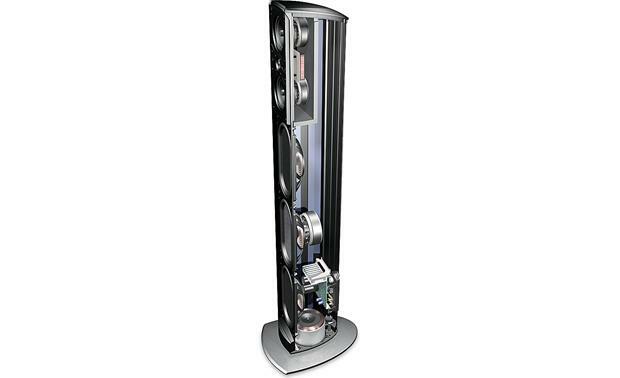 The Mythos STS SuperTower speaker delivers impressive, high-end home theater sound. In fact, Stereophile's Wes Phillips wrote, "It just may be the best loudspeaker I've heard for $3,000/pair" (August 2008 issue). It features a sleek aluminum cabinet and some of Definitive's most advanced components and technologies. Save floor space by having the subwoofers built directly into the tower speakers. But what really sets the Mythos STS apart from typical speakers is the SuperCube® powered subwoofer built right into the cabinet. 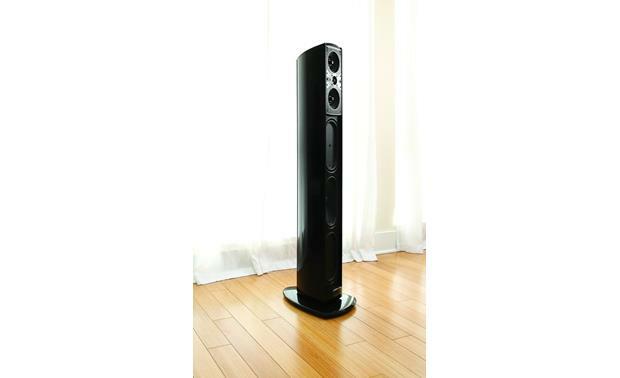 It allows this speaker to generate startlingly deep bass, for big home theater sound. Near the top of the cabinet are two 4-1/2" midrange drivers flanking a 1" dome tweeter, all acoustically isolated in their own sub-enclosure to prevent interference from the bass drivers. Each midrange features Definitive's Balanced Dual Surround System (BDSS) technology, which employs rubber surrounds on both the outer and inner edges of each speaker cone, for more stable, precise motion resulting in exceptional clarity. The pure aluminum dome tweeter has a special ceramic coating, so you'll hear loads of sonic detail without the edginess of lesser tweeters. The lower section of the cabinet holds a 5" x 10" racetrack-shaped woofer reinforced by two bass radiators. This combination creates a total surface area that's actually greater than that of a traditional 12" woofer, but the three-driver approach provides better low-frequency control, speed, and detail. A built-in 300-watt amplifier powers the subwoofer, delivering massive bass that eliminates the need for an external sub. Aside from saving you some floor space, the built-in subwoofer ensures balanced system sound because the bass is already perfectly blended with the mids and the highs. The subwoofer also has an adjustable volume control so you can fine-tune the bass to suit your room or taste. Definitive took a step away from the traditional look of boxy floor-standing speakers, and built the Mythos STS's slim, curved cabinet using contemporary design principles. The enclosure is made of black hand-polished aluminum, and rests on a polished granite base to ensure total rigidity and stability. Hooking it up is as simple as running one set of speaker wires from your amplifier or receiver to the speaker. Is these speaker able to use the atmos sound format? Hi, I bought only the center speaker. Not sure what is the atmos sound format. 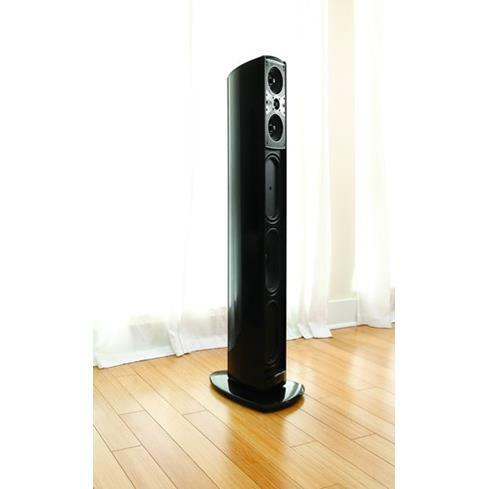 Thanks..
Overview: The Definitive Technology Mythos STS SuperTower is a tower loudspeaker with a built-in powered subwoofer. The Mythos STS SuperTower design offers a truly full-range loudspeaker that combines the accuracy, imaging, and detail retrieval of a monitor speaker with the depth, dynamics, and bass output a separate powered subwoofer into one visually attractive, small-footprint enclosure. The Definitive Technology Mythos STS SuperTower utilizes a 1-inch pure aluminum dome for extended highs and two 4.5" high-definition cast-magnesium basket midranges for smooth sounding vocals. 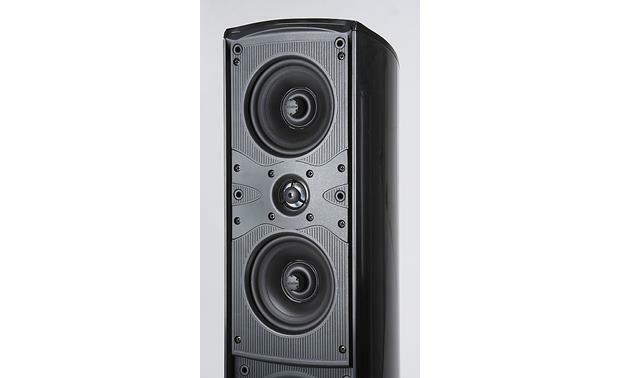 The Mythos STS SuperTower also features a "racetrack" shaped carbon fiber active driver powered by a built-in 300-watt Class-D amplifier and pressure-coupled to two "racetrack" shaped low-bass radiators equal to the surface area and bass output of a 12-inch woofer but with far greater control, definition and speed; eliminating the need for a separate subwoofer. The STS SuperTower features a and-polished gloss aircraft-grade extruded aluminum enclosure with proprietary damping technologies and polished granite base to ensure total rigidity and stability. 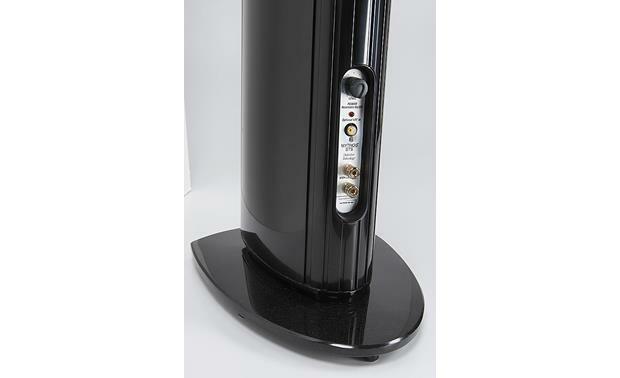 The Mythos STS SuperTower has been engineered for music listening and home theater enjoyment. BDSS Technology: Definitive Technology's Balanced Double Surround System (BDSS) driver offers a wide-bandwidth accurate frequency response, broad dispersion, low distortion, and detail retrieval; so you hear more the music with greater accuracy and enjoyment. BDSS drivers incorporate the following design features. Mineral-Filled Polymer Cone: The loudspeaker features a deeply drawn mineral-filled polymer cone engineered using sophisticated 3D modeling techniques for wide range performance. High Temperature Voice Coil: The driver's high temperature, oversized, lightweight vented voice coil offers improved power handling and quick transient response. The voice coil is also lengthened to increase linearity and lower distortion. High Definition Midranges: The Mythos STS SuperTower contains a D'Appolito array consisting of two high-definition 4-1/2 inch drivers surrounding a 1-inch dome tweeter housed in an acoustically isolated sealed enclosure. The drivers feature Definitive's patent-pending Balanced Dual Surround System (BDSS) technology that supports the speaker cone at both the inner and outer edges for longer, more linear excursion, greater clarity, and finely textured inner detail. The driver baskets are die cast Aluminum. Pure Aluminum Dome Tweeter: The tweeter is a pure aluminum dome, which has been heat-treated to relax the crystal structure and then coated with a ceramic to produce extended, smooth highs. 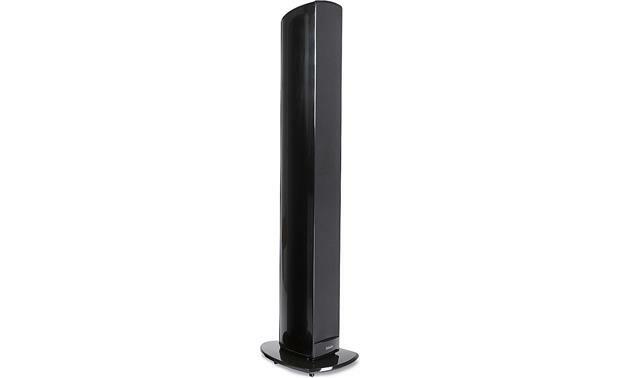 Magnetically Shielded: The Mythos STS SuperTower is magnetically shielded for safe placement near your television. Break-In Period: The Mythos STS SuperTower will sound good right out of the box; however, an extended break-in period of 40-60 hours or more of playing is required to reach full performance capability. The break-in period allows the suspensions to work in and results in full bass, a more open midrange, and smoother high frequency reproduction. Powered Subwoofer: The 5 x 10-inch "racetrack-shaped" polymer/carbon composite subwoofer is powered by a built-in 300-watt Class D amplifier and pressure-coupled to two 5 x 10-inch "racetrack-shaped" planar low-bass radiators for a total bass radiating area greater than a 12-inch woofer; but with far greater control, definition, and speed. 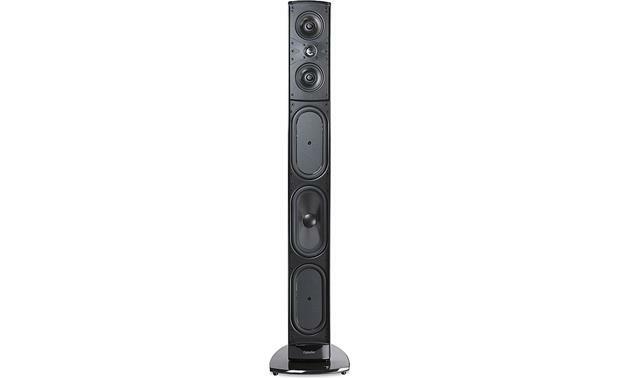 A pair of STS tower loudspeakers is like having two 12", 300-watt powered subwoofers in your room without taking up anymore floor space. The result is bass that is deep, powerful and impactful while at the same time having tight, controlled, and accurate response. The built-in powered subwoofer also provides the following features. Auto Turn-On: The Mythos STS's built-in active power subwoofer section must be plugged into an electrical socket using the supplied 10' AC cord. The Mythos STS has a special circuit which automatically turns the powered subwoofer section on when a signal is fed to the loudspeaker and turns off when there is a no signal (for 1-hour). LED: An LED on the back-panel will light up when a signal is sensed and the amplifier turns on. The LED will automatically turn-off when there is no signal (for 1-hour). Built-In Crossover: Definitive's engineers have perfectly adjusted the crossover and phase between the subwoofer and main speaker sections of the Mythos STS SuperTower to achieve seamless blending and life-like sound. Note: Please not that there are no controls to vary the crossover points or phase because these have been factory calibrated and set to provide perfect blending. Level Control: The Mythos STS SuperTower has a bass-level control which allows you to tune the output level of the built-in powered subwoofer section to match your room and personal listening preferences. Protection Circuit: To prevent accidental damage to the subwoofer built-in the Mythos STS SuperTower from overdriving the system, the built-in powered subwoofer section features an internal overload protection circuit, which will turn the powered subwoofer off or down when overdriven or overheated and will then resume normal operation after a few minutes. Curved Extruded Aluminum Enclosure: The enclosure is extruded aluminum with internal ribs for stiffening purposes. Strips of damping material are adhered to the inside of the extrusion to suppress ringing. The baffle is "Polystone" a dense and non-resonant mineral-filled polymer material that is slightly oversized and is force-fit into the extrusion "mouth" to prevent the aluminum from ringing. The midrange/tweeter array is isolated from the woofer enclosure by two pieces of MDF. Both woofer and mid/hi enclosures are sealed. The slim, curved shape of the enclosure reduces diffraction contributing to the ST's broad imaging and deep soundstage. Speaker-Level & Line-Level Connections: The Mythos STS SuperTower is equipped with a pair of gold-plated, 5-way binding posts to attach your receiver's speaker wire and a gold-plated, mono-RCA/LFE input to connect your receiver's LFE/subwoofer output. 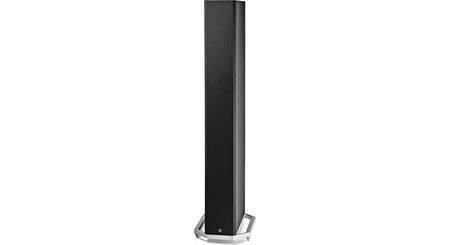 Granite Base with Adjustable Feet: The granite base combined with the heavy Toroidal transformer mounted on the bottom plate of the loudspeaker's enclosure provides a low center of gravity for superior stability. The base incorporates 5 adjustable-height metal feet that may be fitted with either smooth furniture glide tips for wood and ceramic floors, or spikes for carpeted floors. Applications: The precise accuracy, wide-range response, and high impact dynamic range of the Mythos ST allow you to use the speaker in most home audio/video system's ranging from a 2-channel music-only to a 7.1 channel home theater system. When used as a stereo pair, simply connect it with speaker wire as one would any pair of speakers; there is no benefit to using the low-level LFE inputs. When using the ST in a multi-channel system there are two options. In addition to speaker wires connect low-level cables from the LFE/Subwoofer output of the receiver/processor to the LFE inputs of the ST (Y connector is usually required). Set bass management as Front=Large, Subwoofer=Yes. The benefit of this hook up method is that one now has the ability to control the level of the LFE channel relative to Front L&R bass. 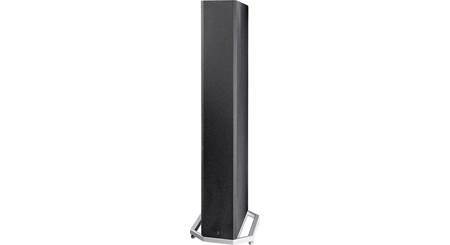 Placement: The Mythos STS SuperTower loudspeaker can be used as a Main or Surround speaker. Fronts: When used as a front main speaker, you should create an equilateral triangle between the speakers and your listening area. The speakers should be angled toward the center of the listening position for brighter, clear, sound with a sharper focus and a more solid central image. 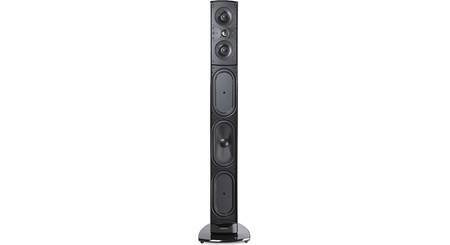 Pointing the speakers straight forward, parallel with each other , will result in a warmer less sharply focused sound. To get the best possible imaging and most even tonal response, avoid placing the speakers less than 3-feet (1-Meter) from your room's walls. Surrounds: When used as rear or surround speaker, the Mythos ST may be located on the side or behind the listeners. When used on the sides, take care never to locate the speakers forward of the listeners. When the side/rear speakers are close to the listening position, do no aim the speakers directly at the listeners. Got two of these from Crutchfield delivered few days ago and going to run them with Yamaha RX-V685 - any audio cable you want to recommend or the basic 16 guage speaker wire will do? I used 16 gauge elec wire for the main speakers and a separate 18 gauge RCA plug for the subwoofers. I only have to go 15 ft to the far speaker from my Yamaha amp. No problems at all. How do these compare with the Def Tech Mythos ST... i'm assuming the STS came out after the ST as a replacement, not sure if i'm correct about that or not as these are smaller and from what i understand slightly a lesser version of the original ST. Am i correct in this thinking? Please respond, im genuinely curious, and it will help me tremendously, haha. It not the speaker system that controls atmos sound it's the receiver you are using that has that capability. Once you have a receiver that has atmos capabilities then add additional speakers to your system to satisfy the atmos sound field. the real answer is, I have no idea. However, I do know that at the end of June 2014 Dolby Labs hardware partners announced that Dolby Atmos would soon be coming to home theaters. So from that I would doubt that the speakers will handle all of the discrete audio channels you're talking about. 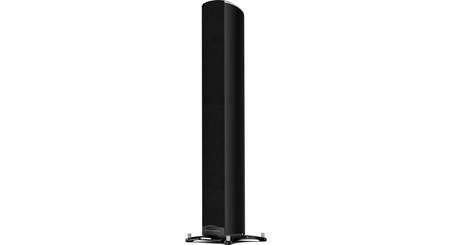 Searches related to the Definitive Technology Mythos STS SuperTower® Floor-standing speaker with built-in powered subwoofer.